I started off on my IAYP journey thinking that I would merely add to my personality without any real interest in completing it. I was in the 8th grade when I was talked into this programme by my mother. I started off by thinking that this was a lot of work; getting involved in activities I normally didn't think of, filling in the log book and running after teachers and coaches for signatures, but all I can say today is that I couldn't be more grateful to my parents and school for pushing me toward this program. To fulfill my bronze requirements: I learnt to play the guitar for Skills, for Service I helped build houses with the Habitat for Humanity near Mumbai and taught English/Math to underprivileged children near my school. I went camping for my Adventurous Journey section where I did mountain biking, rappelling, camping, and learnt survival skills among other things. My football coaching took care of the Physical Recreation section. All these activities together ensured that I received the Bronze Award. Getting caught up in the pressure of 9th grade I almost forgot about this programme even though I was continuing to do the work required for the Silver Award. It had become so much a part of my life that I didn't even realise that I was doing it. Building skills and helping others had became such a part of my system that the Award requirements were furthermost from my mind! One day as I was looking at my Bronze award, I decided to complete all the three levels of the IAYP, since I had enjoyed participating in this programme. I continued working on my profile to receive my Silver Award. I finally received this award in June 2013. Here are a few memories that I am going to share with you and these are memories that will live on with me forever. 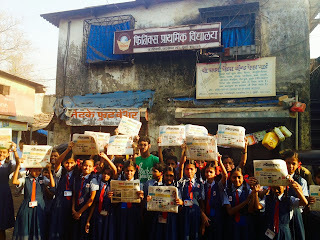 The biggest and most important memory is my Service project, "The Newspaper Project". 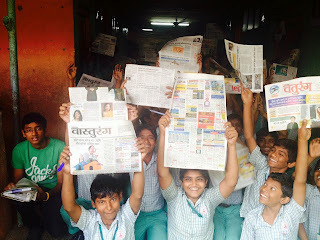 This involves educating and making under-privileged children aware of what is happening in the world and their country (India) and also opening their eyes to opportunities for them through reading an English or vernacular newspaper. The project involves teaching the children about the newspaper, it's components and the benefits from reading it and arranging for subscriptions to the schools of under-privileged children. I identified a couple of newspapers that I would distribute; this included Lok Satta, DNA, Times of India, etc. to these schools. The main objective of this project is to impart education and create awareness about the world around us. The less privileged population of our country is uneducated and that is holding India back from becoming developed. What usually happens is that since the parents are uneducated, while their kids attend school, they tend to not know what is happening around them. They assume that the world around them is like what it is in their locality alone, but are unable to see the larger, more beautiful picture and opportunity. The parents of the less fortunate kids and their schools usually don't give their children access to newspapers due to financial reasons. So what I did was assemble a core group of about 15-20 of my friends and their friends, to help complete the project. I had friends from my earlier school and others from a Rotaract Club help. We personally visited schools where my volunteer friends and I explained the importance of reading and the various sections of the newspapers. With a better understanding of the newspaper, these students can now be aware of what is happening in their country and the world as a whole. This then helps them to get a picture of the type of world they live in and helps them appreciate the enormous opportunities for themselves and their community. Some of the underprivileged children have written thank you letters to me which are very special to me. We have already made our mark on 20 Mumbai schools, by teaching about 1000 children in four months about newspapers. I'm aiming to try to help every school that enrolls with the project and slowly expand the project to neighbouring cities. For the subscriptions what I did was organise my volunteers to visit door-to-door in their own locality and ask for a subscription as a gift. They then handed me the cheques. From here, I took the full and sole initiative and responsibility of the programme. I visited large newspaper companies and their printing presses. I met editors/marketing heads to hand them these cheques for a yearly subscription of a certain newspaper. These newspapers are now being delivered to the listed schools. The other activities that I engaged in was to learn how to play the guitar, learn to play badminton and travel for international football camps. Throughout the journey of one year I have been learning to play the guitar. It was part of my skills development. I used to have to force myself to play and practice the guitar, but once I understood and was able to read music, I started loving it and playing on a regular basis. If there was no IAYP, I would have had no motivation to learn to play the guitar or even read music, but now this is one skill which I will cherish for the rest of my life. My regular football coaching made up my physical activity requirements. To complete my profile for the IAYP Silver Award, I completed camping trips to Rishikesh and one international culture trip, yet I wasn't satisfied. The adventurer in me had awakened thanks to IAYP. It was the start of my summer vacation. As I browsed the internet to search for interesting summer camps, I came across an international football camp. I travelled all the way to Manchester for a football camp with European giants Manchester United. I trained in their football school for about a week before returning. It was an absolutely wonderful experience, living alone, cleaning your own room, doing your own laundry and of course, the football part of it was amazing! It's a whole new experience when you travel to another country to play football, meet new people from all over the world and make lifelong friends. The whole thought just amazes you. I'm now working on my Gold Award. I'd like to thank IAYP for all these fantastic memories. Without it, I would have nothing to write home about and no heart-warming memories like I do now, thanks to it. It is a fantastic programme and I hope by reading this all of you would be motivated to join the programme. One thing I have learnt from the IAYP programme is that people tend to surprise themselves with the things they do and undertake when there are no limits. IAYP has provided this platform for me and I hope it does for you too.